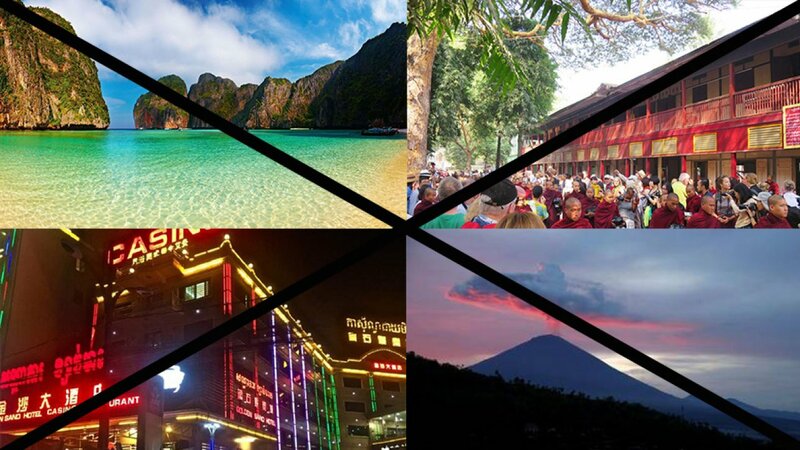 Once famous for its beaches, the city is now dominated by casinos and tacky commercial centres. A surge in development has resulted in too many construction sites, and the heavy trucks have damaged the roads leaving them full of potholes. It’s not just us that thinks this either, read more here. 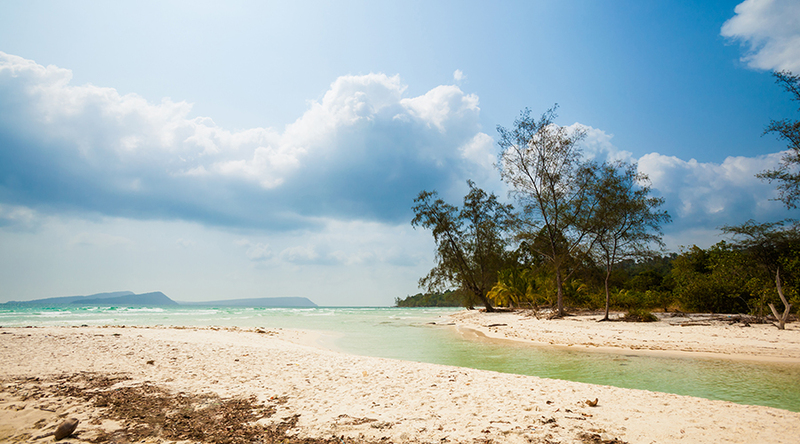 Luckily it’s not all doom and gloom, as the city is the jumping off point for idyllic islands such as Koh Rong, Koh Rong Sonaleum, Koh Russei and Koh Krobei. Here you’ll find peace, quiet and unspoiled beaches. 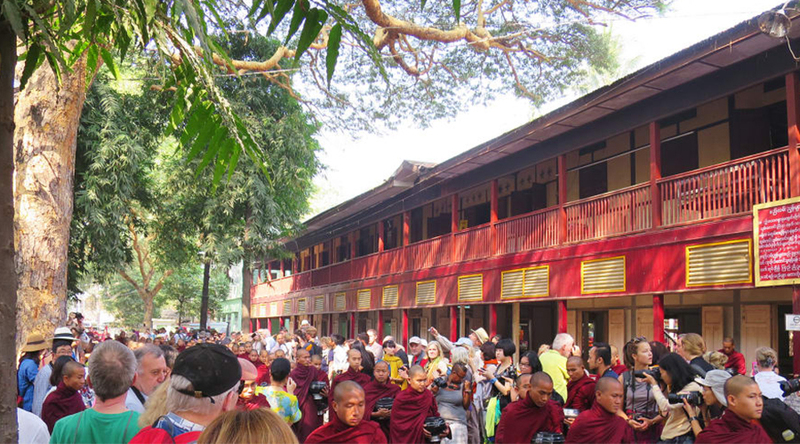 Lunch with the monks at Mahagandayon Monastery in Amarapura near Mandalay is a popular tourist draw. But with this popularity comes tourists – hordes of them. This once-peaceful lunch has now become a noisy, boisterous affair with the constant clicking of cameras from tourists – many in ‘less than respectful’ attire (we’re being polite here!). So give this one a miss, there’s plenty of other monasteries throughout the country which are equally as impressive and a great opportunity to visit. We’re all for going out of our comfort zone, but the night train from Yangon to Bagan takes ‘roughing it’ to extremes! The journey is so bone-shaking and bumpy that walking to the (far from clean) toilets is actually quite dangerous. 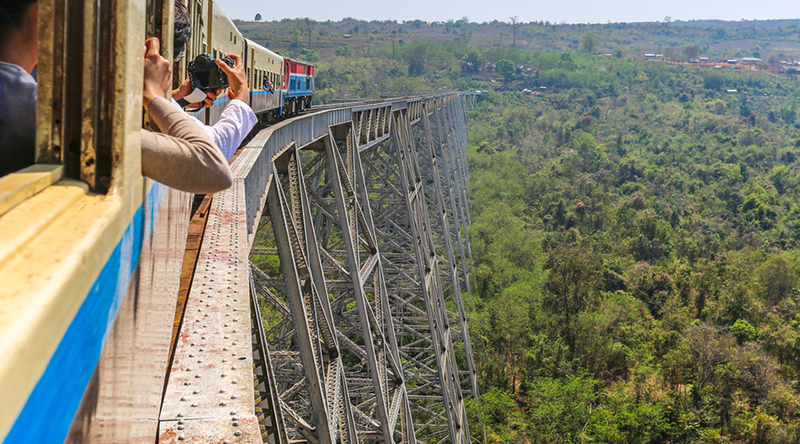 Instead, ride the Circular Train in Yangon, or take the scenic train journey from Pyin Oo Lwin to Hsipaw that crosses the incredible Goteik Viaduct. This stunningly beautiful bay where ‘The Beach’ was filmed is currently off-limits to visitors. The bay and its marine environment has been seriously damaged by thousands of day-trippers so the decision was made to close the beach indefinitely to allow the ecosystem to recover. And it seems to be working, as black-tipped reef sharks have recently been spotted there! If you still crave that Instagram pic, boats are allowed to moor a little way off from the beach. 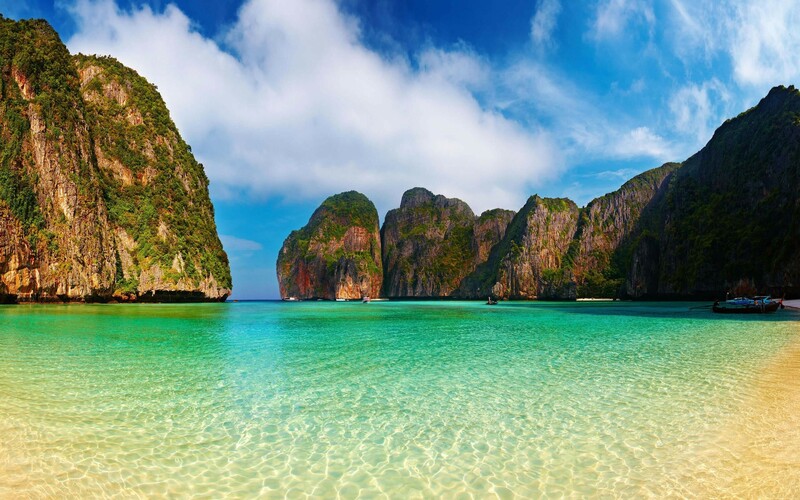 But let’s face it – there’s lots of other amazing places to visit in Thailand – why not take a boat trip to Phang Nga Bay to see the famous limestone cliffs? 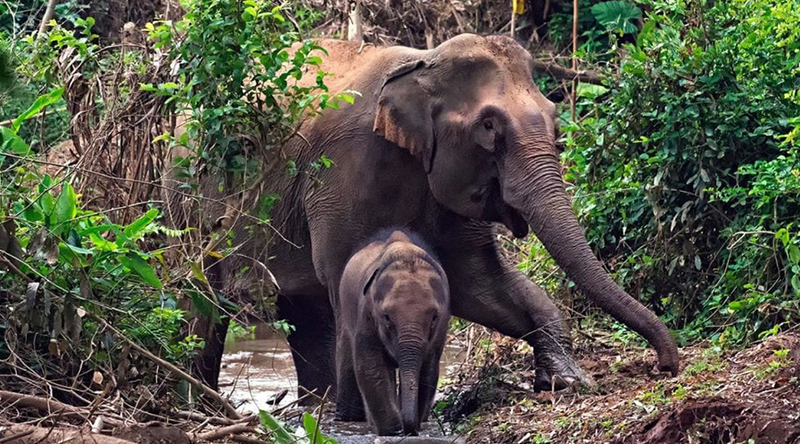 As per our travel policy, we don’t recommend visiting elephant camps in Laos due to the mistreatment of the elephants. However there are several elephant sanctuaries where there are no elephant rides, no circus tricks and no evening elephant dances. At Mandalao and the Elephant Conservation Center in Sayaboury we can observe these huge mammals splashing in the river, playing in the grass, and snacking on the forest canopy. Mount Agung in Bali has been erupting periodically since 2017 when a huge eruption sent ash spewing into the sky. Needless to say, climbing this angry mountain is not possible! Although that doesn’t stop everyone and just within the last few months, several tourists have got into difficulties while trying to scale the mountain. 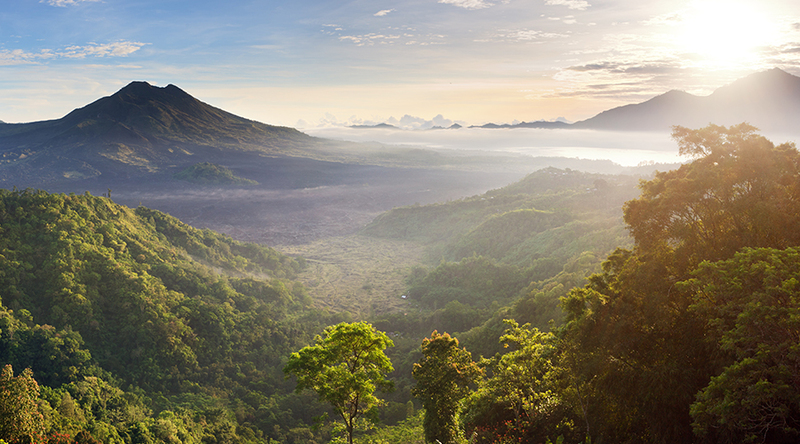 Instead – climb Mount Batur. A sunrise trek is a magical way to start the day, not only do you get to watch the sun rising, but there’s also wonderful views looking over Lake Batur.